Team Sketching - A Panoramic Party! Team Sketching – A Panoramic Party! I had the chance to talk with Don Owen Colley, who is a premier illustrator, demonstrator and the co-instructor with Peggy Condon for “Team Sketching – A Panoramic Party!” workshop during the 2018 Chicago Sketch Seminar. Here is one workshop that you really should consider. Wes: Don, it’s good to talk with you again this year and I am interested in this Team Sketching workshop you are leading with Peggy Condon. What should people know and what can they expect? Wes: Panoramic Party? That sounds like a three-dimensional sensory experience of some kind. Don: "The Panoramic Party" is what we are calling this workshop. Think of it like the sketchers' conga line. Everyone has a role and is connected to the rest of the group but each person brings their individual interpretation to the sketch. All who sign up for this party are going to have fun, play with new ways to sketch, and discover a whole new way of seeing an urban setting. Others will be jealous when they hear what we're gonna do. Wes: It seems to me that if I am working on a sketch that is part of a bigger, collective sketch, I would need to make sure that all of my lines match up to the next person’s sketch. Is there any concerns about the sketches not matching up or tiling together perfectly? Don: No, not at all. In fact if you think of some of the pieces you know from David Hockney, where hundreds of individual photos are laid out to create a collective image, but nothing matches up perfectly, that is what we are attempting to do with the Team Sketches. There is perfect in the imperfect. Did you know that mistakes happen when you are trying too hard to be perfect? So why sweat it? Mistakes are where the best learning happens anyways. This workshop is a safe learning environment where everyone is learning from each other and there is no judging. Everyone is learning new tips and tricks from each other and bringing their individual experiences and perspectives to the party. That's what makes a team strong. And in this workshop, every team member is important and is needed. All skill levels are welcome and encouraged. If you are a seasoned artistic professional, a hobbyist or just learning how to draw for the first time, we need you to be part of our team. You have life experiences that no one else has and we need you to make this team work. If you go to the website https://chicagosketchseminar.wordpress.com and click on the “registration” tab, then click on the “BOOKWHEN” type, it will take you to the list of workshops. The Team Sketching workshop is WS 16 on Saturday morning from 10:00 am to 1:00 pm and Sunday afternoon 2:30 pm to 5:30pm. So what do you say? Will you be part of the team? Have you ever been sketching on location when someone admires your work so much that you feel compelled to give them the sketch? Or how many times have you been to a party, or family get together, and want to show your latest sketches but didn’t think to bring the sketchbook with you? Well, before you tear out the sketch and hand it over, or pat your pockets in a vain effort to show the sketch that you don’t have, you will learn the skills and tools to easily capture your sketch with your phone. Capture it and make adjustments before you make someone’s day a little brighter. With this workshop, you will be able to call up your sketches faster and more impressively on your smart phone. Here is one workshop that will show you one of the most valuable skills you really need to know. Does it matter what kind of phone that I have? "All of these tools and apps that I am sharing with students will work across different platforms. I use an iPhone, but bring whatever phone you have, or tablet device, and I will work with you in this workshop." Learn how to capture, how to adjust, and how to share your sketches with your urban sketching brothers and sisters. Urban sketching is a social sketching group and this workshop will give you hands-on training on getting your sketches ready for sharing online and on your mobile devices. The tools are free or inexpensive and will allow you to make adjustments while you are still on location. And the best way to protect and archive your original sketches is to have digital versions of them. Make your sketch images look as good online as they do in your sketchbooks. Bring your sketchbooks with your smart phone and Kordt will show you how you can make both work for you better and more easily. You get to work directly on your sketches from the Sketch Seminar and be sharing with the Urban Sketchers group before your next workshop. You can see how Kordt fixed one of my sketches (left). Playtime for Artists at "Tools for Urban Sketching"
There is this notion of “play” in the world. On the one hand, it is reserved for children to engage in an activity for enjoyment and recreation. You sometimes hear play associated with sports in the context of competition. On the other hand, it’s not meant for the serious or the practical purpose. Adults are expected to be "grown up" and "not play around," "waste time" or "goof off." When did playing around become a bad thing? As an adult you shouldn’t buy into that. In the Chicago Sketch Seminar, anyone with an interest in trying out new things, learning new skills and messing up on purpose are welcome to register and sign up for the workshops that interest you. In fact, "play" is experimenting and trying out new ideas without bias or a preconceived notion of how it will turn out. 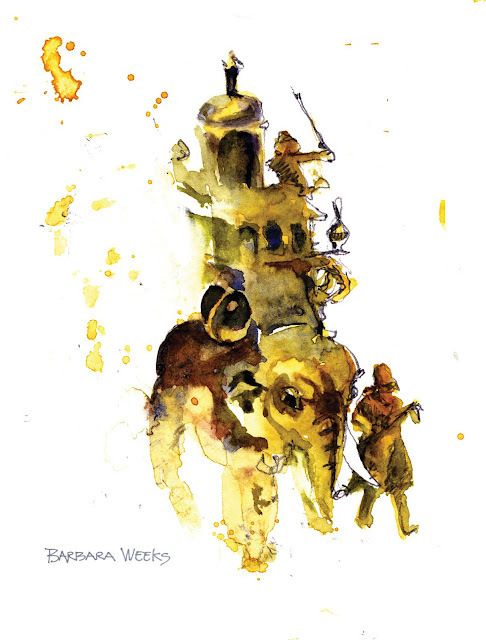 This is the urban sketchers' definition of "play" and it is at the heart of every workshop offered this year. Here is one workshop that you really should consider. Wes: What would you like participants to know about this workshop that they may not understand from the above description? Amy: We will explore many types of drawing and painting tools and the interactions of the different media with water and/or ink. I will bring many tools for people to try-out, including special papers. The goal is to explore combining media types to create sketches that are truly your own style. This workshop is an opportunity to experiment and discover a new way of working. Using two or three new tools/media on your sketches may excite your sense of color and shape and make you think in new ways. Wes: What type of workshop is this: Demonstration? Lecture? Working session? Discussion? Amy: This workshop is going to be part demonstration and part working session. Students are encouraged to bring their sketchbooks and use my tools to enhance their enjoyment of sketching by combining certain media they may not have tried. For the first half hour or so of this workshop we will try out combining certain media with water and ink and I will explain which combinations work well together, then we will have 1 hour or more for sketching in the courtyard of the Palette and Chisel. In the last hour, I will demonstrate to interested students how to use ProCreate to color or test color a drawing and how to use the adjustments menu to make changes to your sketch. I will also introduce students to 2 or three other sketching apps that work really well and explain why I think they are superior to other apps. Here is a partial list of the tools I will be bringing for my students to try out. FX acrylic inks – These inks dry shiny and add visual interest to any sketch. Frixion Erasable gel pens 24 color set - These pens allow you to add highlights with erasure and also soften edges with water since they are somewhat water-soluble. I will also have samples of papers to try out. Students are encouraged to bring their own sketchbooks and use the tools I provide to see what happens on their chosen paper/sketchbook. Wes: Sounds great Amy! And that's only a partial list? That's a lot of stuff. I assume there be some time for sketching or drawing in this workshop? Amy: Yes, we will be scribbling away throughout the entire workshop. It will be 3 hours of playtime! Wes: Playtime!? I think you said the secret word of the day. Do you have any examples of how sketches might look before and after this session? Will you be able to show how I can make my images look better and why? Wes: What is an example of one of the coolest tools for urban sketching you have found? What makes you excited about this tool and why? Amy: The coolest thing I want to express to the students is that by combining dry and wet media in layers the student can discover a unique and definitive style for their sketches that may advance their enjoyment of the outcome. Wes: Will this make urban sketching easier, faster, better or more awesome? Amy: Wouldn’t it be great when a student discovers a combination of tools that they feel intuitively defines their vision of how they want their sketches to look and advances their technique? I will also be demonstrating best practices for what I’ve discovered in techniques such as layering, planning, combining, choosing media and simplifying using mixed media tools. Wes: Will you also be able to share some of the downsides for each of the products (pros and cons for an informed purchase decision) or some of the watch-outs as well as the benefits? Amy: Yes, I will be telling all that I know about my experience with these tools. Wes: Do you represent any of the companies for the products shown? Amy: No, I don’t represent any of the companies. I’m just an artist that gets excited about all the new products that are available on the market and want to share them with fellow creative people. Wes: Amy, this sounds super-exciting and perhaps the most valuable investment of time that any artist could spend. The fact that you are not giving a sales pitch says to me that you are passionate about these products you have found and are giving a real gift to those who register for your workshop. Remind me again how people can sign up for your workshop. Amy: Sure. If you go to the website https://chicagosketchseminar.wordpress.com and click on the “registration” tab, then click on the “BOOKWHEN” type, it will take you to the list of workshops. My workshop is WS 03 on Saturday afternoon from 2:30pm to 5:30pm and Sunday morning 10:00am to 1:00pm. Like I said before, we are going to have THREE FULL HOURS OF PLAYING AROUND WITH COOL TOOLS. I hope you be one of them Wes. This workshop will present a wide variety of tools for Urban Sketching, both traditional and digital. Amy will share her experiences with these tools, will demonstrate them and allow students access to a variety of tools, including digital. Amy will share her extensive experience with digital apps to help artists sketch in new and innovative ways. practices involved in using them. Amy will also explain best uses of tools for specific graphic applications. Students will learn how to blend different media for maximum effect. 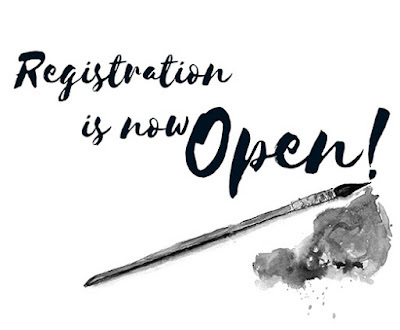 Registration for the 2018 USk Chicago Sketch Seminar is now Open!!! Registration is Now Open For The USk Chicago Sketch Seminar. Here's a direct link to our registration site (Bookwhen.com). We hope to see you this summer! Only 1 more day until registration opens!!! Registration day is almost here! Please visit our Seminar blog for more information. We hope to see you in Chicago this summer! Meet the instructors individually on the Seminar blog. That's the go-to-place for information on our 2018 Sketch Seminar. If you're lucky enough to be going to the 9th Urban Sketchers International Symposium – Porto in July, the USk Chicago Sketch Seminar is a good place to warm up your skills! If not, it's the perfect place to work on your sketching and have a fun time without going far from home! Want to see the eighteen different workshops and their descriptions that will be available at our seminar in June? They're right here! You can start planning your March 15th registration now. I am often asked how I am able to sketch people in public without getting people angry or upset. After years of sketching people at airports, on commuter trains and even while in waiting rooms, here is what has worked best for me. Perhaps one of these will work for you. A special thank you to fellow urban sketchers Ted Gordon, Angie (Haugh) Novak and Emily White for their experiences and shared tips. 1. Sketch first, ask later. In my experience, when you first ask for permission to sketch a person, it may be met with initial resistance, or it will effect the pose you were originally attracted to. Besides, if you already have a sketch started and the person asks what you are doing, having a concrete example can work better than explaining what you are planning to do. 2. Creative Disguising. Normally accepted disguises, such as hats and sunglasses work well to cover your gaze. The idea is to blend in, not stand out and attract attention so sunglasses in a dark restaurant or tavern might cause suspicion. 3. Sketch in a smaller book is a great way to disguise that you are drawing. 4. Don’t Be A Bobble-head. Pick a more crowded location. If you are the only other person in the room, anything you do will be noticeable. Cartoon of head movements. 6. Sketch from inside your car. Lots of people eat or have phone calls inside their car. Sad cartoon of lowly artist sketching from behind steering wheel. 7. Sketch from an upper level, or from the side, out of their line of sight. Sketching from below is still within their peripheral. 8. Capture first in pencil to block out the basic posture and position. Add color or shading later if you have time. For moving subjects, go for your impressions of their movements such as dancers or skateboarders at the park. 9. Pick subjects who are fully engrossed in their activity. Examples might include commuters on their electronic devices, a chef at work behind a viewing window, or an athlete during a sporting event. 10. Invite a friend to lunch or coffee and chat while sketching over their shoulder. I used this technique when I got together with Liz Steel while we planned out our WGN-TV interview while sitting at a coffee shop. She, of course, did the same and we sketched in opposite directions. In the event that you do get "caught" and the subject confronts you, simply show them your sketch and allow them to look at it. Most of the time, people will be relieved that you were not taking photos and sketches are more flattering than photographs. Feel free to start a conversation with the person if the opportunity presents itself. I'd love to hear which one works best for you and your stories of how it turned out in the comments below. Last year was quite a year for USk Chicago – 10 Years 10 Classes, the 8th International Urban Sketches Symposium, TV coverage, monthly sketch meet-ups around the city, and more. It seems this blog then took a deep breath for six months! Now we're off and running again! We've started planning for our summer Usk Chicago Sketch Seminar that will be held on June 1-3, 2018! Lot's of details to follow, but in the meantime, we've been accepting teaching proposals for our seminar workshops. The January 31st deadline is fast approaching! 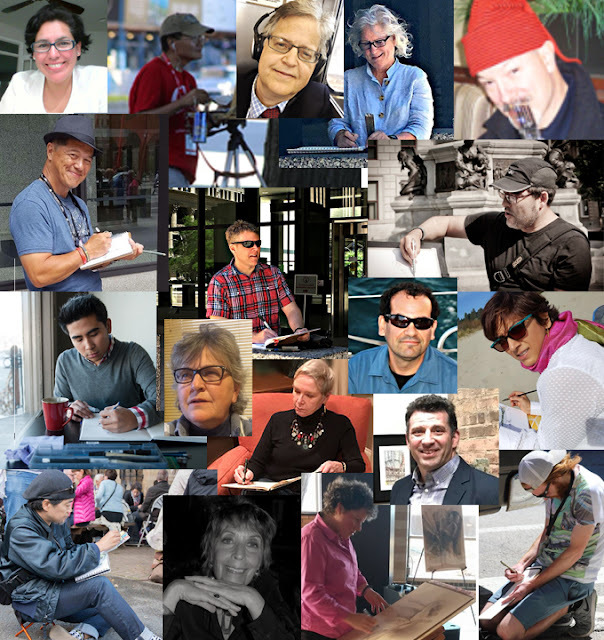 If you're interested in applying and/or have questions, leave a comment here or send a FaceBook message at Urban Sketchers Chicago to Alex Zonis or me (Barbara McCafferty Weeks). We'd love to hear from you!